Home > Baby > UPDATE – Maxi-Cosi Pria 70 Convertible Car Seat (Black Gravel) Only $150.27 + Free Shipping From Amazon! UPDATE – Maxi-Cosi Pria 70 Convertible Car Seat (Black Gravel) Only $150.27 + Free Shipping From Amazon! 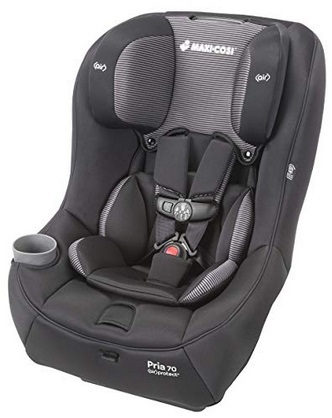 December 6, 2018 Comments Off on UPDATE – Maxi-Cosi Pria 70 Convertible Car Seat (Black Gravel) Only $150.27 + Free Shipping From Amazon! UPDATE: Now clip the 5% off coupon that is on the product page to bring the price down to only $150.27 + Free shipping! Amazon has the Maxi-Cosi Pria 70 Convertible Car Seat (Black Gravel) marked down to only $158.18, plus clip the 5% off coupon that is on the product page to bring the price down to only $150.27 + Free shipping! With premium fabrics and padding as well as superior safety features, this Maxi-Cosi car seat accommodates an expansive weight range, fitting children from 9 to 40 pounds rear-facing and 22 to 70 pounds forward-facing. It includes the innovative FlexTech system for multi-directional energy management and additional protection from side collisions thanks to the revolutionary AirProtect advanced side-impact protection. Self-wicking fabric draws liquids away from the skin and deodorizes, keeping your little one comfortably dry while traveling. Easy to clean, the seat pad unsnaps and slips off the frame, ready to go into the washing machine and dryer. Specially designed to fit better in your car, it allows more room for your passengers to stretch out in the front seat. This car seat meets or exceeds federal, ASTM, and JPMA safety standards and includes a one-year limited warranty. Maxi-Cosi believes in doing as much as possible to help parents as their families grow. Having carried more than 50 million babies home from the hospital, Maxi-Cosi has come a long way since it introduced the first baby car seat in Europe in 1984. Today they are the leading brand in Europe, selling products all over the world. Today Only – Save On Cross Pens – Now From Only $10.75 + Free Shipping From Amazon!